A good classroom project has a beginning, middle, and end, and as we finish the ninth week of our woodland and night forest project we are beginning to look for a way to share our work and find closure. Back in October, we saw a strong interest in forest animals and the changing season. We stimulated the children’s thinking with a side table featuring seasonal leaves, pine cones, bark and twigs, and forest animals that children used to create pretend games. It seemed that even with many other activities and classroom investigations present, strong interest in this side table continued to grow. As we listened in on the pretend themes in the forest, we heard a variety of stories about animal families, animals looking for food, and animals looking for warm spaces. It became clear that we could connect the children’s interest in forest animals with storytelling experiences, and with our own relationship to the changing season, with its shorter days and cooler temperatures. There were many informal opportunities to make connections, and we were conscious to use many. When children brought in a warm coat to play outside, we thought together about how animals might stay warm. We watched leaves change color and then fall from our playground trees. When we raked leaves outdoors, we thought about who might live under a pile of leaves and what that might feel like. We watched Canada geese flying overhead when we were on the playground, and thought together about where they might go. And we encouraged children to think about whether it was starting to be darker when they woke up in the morning or when they went to bed as we head towards the shortest days. As children thought more about Halloween, walks in the dark, and worries in the night, conversations shifted a bit towards night time animals. What happens outside when we go to sleep? Which animals come out and which ones sleep when we do? Where do they sleep? 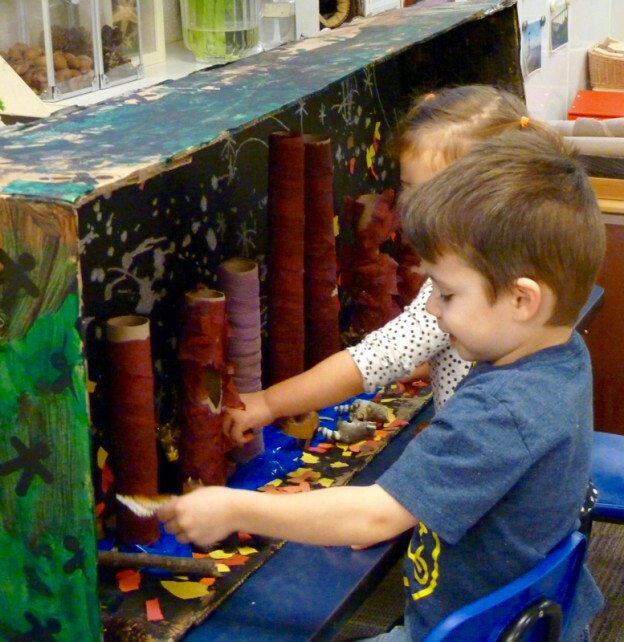 Flannel board and felt stories offer children a wonderful, and physical, way to focus their stories, so we used felt day and night time forest scenes at science to encourage storytelling. It became clear that the interest in night was strong. One child, who is a wonderful storyteller, created story after story about animals outside in a night time forest, and we began to see owls featured in many of the children’s stories. A visit from a local naturalist, who brought a great horned owl in for us to observe closely, stimulated an even stronger interest in owls and other nocturnal animals. We decided it was time to offer children an opportunity to create their own representation of a forest. We brought in a large box (thanks to the parent who donated it!) and asked the children what we might do with it. Children were fairly quick to agree they wanted to make a forest. Our storyteller stated that it should be a night time forest and our collaborative plan began. We’ll add animals to the forest. Some will be in their homes. Some will be out in the forest. Some will be sleeping. Some will be out at night. We’ve been working on our box – painting the inside and outside, adding stars and the moon, deciding how to build trees, over many days. Lately we’ve used the box with the same forest animals we used in October, and will be making some of our own animals soon. We may not realize all the ideas shared through our planning process, but when we all feel finished, we’ll invite our friends and family to celebrate our forest and our growing collaborative skills!